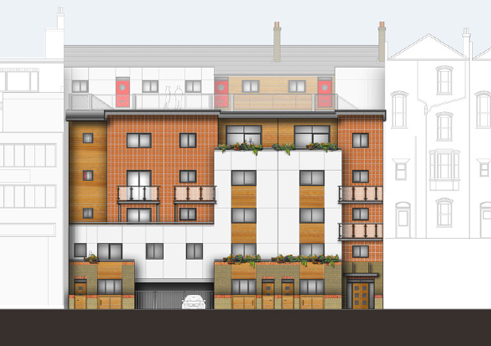 ArtsArchitecture has produced the design and submitted a planning application for a residential development of 24 flats and maisonettes on a site currently occupied by largely-disused commercial premises. The New Road frontage consists of three Victorian terrraced properties of good proportions whose ground floors are currently occupied by shop fronts. 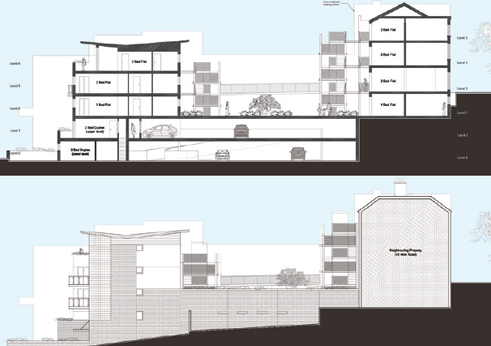 To the rear, the properties have been extended with an agglomeration of flat roof blocks of no architectural merit. 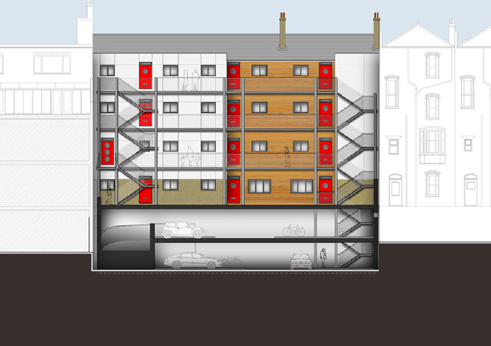 In our proposal, the original New Road block is converted into twelve flats. The frontage is restored, the shop windows replaced with period-style sash windows to match those above in style, and entrances to the ground floor flats created using period-style doors with fan lights above. 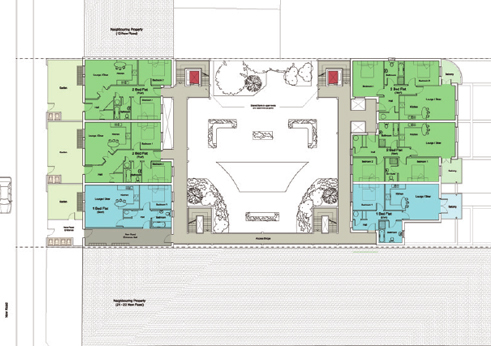 The rear extensions are demolished and replaced with a new build residential block of nine flats above three maisonettes, facing onto The Paddock. 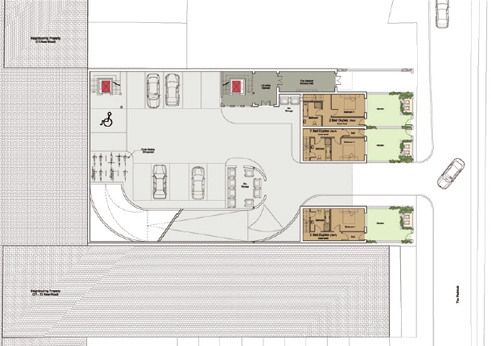 Taking advantage of the considerable fall across the site, two levels of residents’ parking are introduced between the New Road and Paddock blocks, above which is a roof deck forming a private and secure amenity space, with planting, seating and a children’s play area. The materials used for the new build elements include yellow London stock with red brick soldier features, redolent of the existing New Road elevation, together with a mix of western red cedar tongue-and-groove boarding, terracotta tiles and self-coloured render panels. The roof is finished with powder-coated aluminium panels.